Vocal Matrix is more than just an a cappella ensemble—it is a family! We love getting together each week and sharing friendship as well as great music! 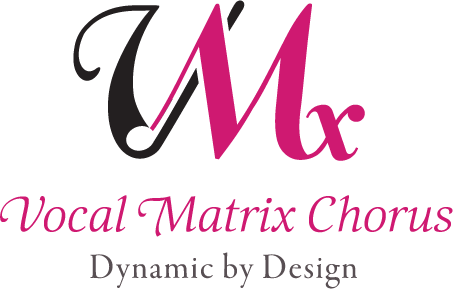 If you like to sing, you’re invited to visit Vocal Matrix and discover your INNER DIVA! Visiting one of our rehearsals is the perfect way to find out more about us, and what we can do for you! You’ll have the opportunity to hear us perform four-part, a cappella harmony, and you’ll be invited to join us on the risers to experience the music, friendship and fun for which Vocal Matrix is known! There are so many reasons to join! Spend time with a wonderful group of women, learn some amazing, classic and contemporary songs (such as Happy/It's All About the Bass, Proud Mary, Bridge Over Troubled Waters, and many more) and get a chance to perform and strut your stuff! The first step is to contact our Membership Coordinator who can answer your questions. Join us at a rehearsal where you’ll be warmly greeted and given additional information. As a chapter of Sweet Adelines, an international organization, we strive to be in compliance with global regulations for storing, using and managing personal data. Please review the organization's Data Protection Policies on the Sweet Adeline's website. Guests are welcome to visit any Vocal Matrix rehearsal, Mondays from 6:30 PM to 9:30 PM.